Home > Politics > Policy & Ideas > Red Star or Dark Star? Red Star or Dark Star? It’s not going to happen in the austerity union and that’s a fact many people are finally waking up to. Scottish Labour’s ongoing political necrophilia sees no sign of abating, but a key turn in the referendum debate may change that. 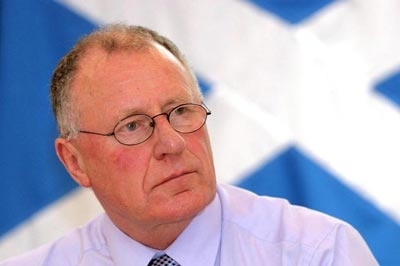 With interventions from Jim Sillars this week (‘Austerity Britain’s Tackety Boots‘)and now Dennis Canavan addressing Labour for Independence, the issue of ‘what sort of society we want to be part of’ is coming to a head. Where can you best achieve social justice? Economic vision, or lack of it, looms large. But wider forces than the benefits narrative of Johann Lamont are at play with Tony Travers, of London School of Economics, saying: “London is the dark star of the economy, inexorably sucking in resources, people and energy. Nobody quite knows how to control it”. These are becoming key questions present themselves for the No campaigns reluctant foot soldiers. By asking Labour voters to vote Yes in the referendum, we are not asking them to change their party allegiance. A Yes vote is not a vote for Alex Salmond or a vote for the SNP. On the contrary, independence could help secure the election of a Labour Government in Scotland. Labour supporters can vote Yes in the referendum and then vote Labour in the first elections to the Scottish Parliament in 2016. Independence would mean that an independent Scottish Labour Party would be able to respond more readily to the needs and aspirations of the people of Scotland. That would help to bring about policies based on Labour’s traditional values of social justice and solidarity. The key question is becoming are Labour members more committed to the British nation than to social justice? For example, a Scottish Labour manifesto could include policies for better job opportunities, a fairer system of tax and welfare, restoring public ownership of postal services and a commitment to get rid of Trident. A Yes vote in the referendum will not alter the historic mission of the Labour movement. On the contrary, it will empower the people of Scotland to fulfil that mission by building a fairer society. This week’s Scottish Social Attitudes survey shows a strong correlation between support for independence and social class. Some 40% of households earning under £14,300 are likely to vote yes, while wealthy Scots are resolutely hostile, and 72% of business leaders are hostile to independence. Contrary to the views of many Labour supporters and liberals, the referendum is not about blood and soil separatism. It reflects longstanding societal divisions about the British state’s direction. As the stage hypnotists of the Better Campaign tumble over themselves to explain the economic benefits of staying within British political institutions these issues won’t go away and the time has come for Labour supporters to join the change movement. But the real issue is not attracting disaffected Labour politicos, it’s about changing the nature of the debate. We remain at present shackled to a country that has seen a stunning increase in inequality, the fastest in the OECD, so that Britain now ranks 28th out of 34 countries in the equality league. It’s inequality, stupid. It’s inequality that is behind poverty, ill-health and the growth of the welfare bill. It’s inequality propelling the escalating demand for credit. It’s inequality that has created our fragile banking system and its still feral proclivities. It’s inequality that has provoked the collapse in productivity, and the stagnation in innovation and investment – evident before the financial crisis and even more so now. This is the truth that cannot yet be spoken. The UK is the fourth most unequal country in the developed world. This is a shocking fact but what’s more shocking is the that this is based on low wages and tax evasion, not sloth. It’s not just unequal it’s unequal because of low-pay not idleness. In Britain you can work 40 hours a week and not earn enough money to feed, clothe and house your family. Scotland is a rich country and we have more than enough wealth to make sure that everyone can live in comfort and security. The problem is that we don’t have the right kind of economy, one that would share wealth more equally and effectively, both between people and round the country. Although I will be voting Yes in the referendum a Labour first government fills me with dread. Lamont doesn’t deserve to be the first Leader of an independent Scotland in fact none of the unionist parties do so unless their is a change in the three of them I wonder if anything will really change independence or not. I’m surprised that people are quoting the social attitudes survey as if its findings were of any relevance to the debate at present. Some of the research was carried out in June last, millennia ago in political time and all of the research was concluded by October before the White Paper was published. In the context of this campaign one might as well be talking about something that happened in 1979. So if you say on the basis of the survey that the wealthy are opposed to indy you have to acknowledge that what you mean is at the time the survey was undertaken the wealthy were opposed to indy. But at that point the Yes campaign wasn’t really directly addressing any community but its natural and committed supporters. Last year for it was about building ground forces. No was doing something else – shouting about the end of the world, a message which the timid bourgeoise responded to. That the middle class at that point was more hostile to indy is hardly surprising in that light. As Yes roll out their positive and aspirational proposals the pro-UK side will find their appeal to the reasonably well off harder to make. It’s a pity that the figures are quoted out of context and with no reference to the appeals the campaigns were or were not making at the time. Profound change is happening so rapidly that the Scotland of June last year is already hard to recognise. Think about the launch of the campaigns – how long ago was that? They already appear to belong to another political and cultural world. I too am filled with dread at even the remote possibility of Lamont and the rest of the Labour crew from Scotland getting into power again at Holyrood whether it be under devolution or independence, but it won’t stop me from voting YES – because it is the right thing to do for Scotland’s future come what may. These weasel words from a couple of days ago should be quoted back at Johann Lamont time and time and time again. When it dawns on the mass of the Scottish electorate what negative effects the “international city state of London” are having and will have on our future she could very well choke on her muesli. Labour during their term of opposition have shown they are incapable of productive consensus government. With the result they have gained little in any way that underlines their competence or commitment to govern an independent Scotland. One issue often raised as a problem for Scotland is sectarianism. It could be argued the examples portrayed by the dogmas of the political pro Union parties are the prime exemplars of this ignorant trait. I find myself kinda hoping that when our new Scotland at last emerges, the momentum of that will create a surge of positivity in the Scots people. I think we will end up with a very different political system that we have at the moment. I agree that the thought of JoLa being at the helm is a very scary thought because she only seems capable of reading out what’s in front of her with no deviation, she’s a bit of a wind up toy for the Tories to play with and her current deputy is clearly in the game for a seat in “the Big House “down south where he can trough his fill. It is unlikely in the extreme that Johann Lamont’s tenure as leader of the Scottish Labour Party will survive a Yes vote. In fact, I think it is equally unlikely that Labour, as it currently exists, will survive. My suspicion is that a new left consensus will begin to emerge with that being built largely around those who have aligned themselves with LFI. The STUC has yet, to my knowledge, to take a clear position and, for me, what they do between now and September will be crucial after a Yes vote. In fact, what the STUC does in the wake of a Yes vote will be even more important than what they do before it. Mike Small wants a society where we ‘share wealth more equally.’ This is an entirely laudable aim. The weakness is in failing to point out that a more equal society will involve a lot of Scottish people losing wealth as well as the least prosperous gaining wealth. Neither Labour nor the SNP has any interest in the sort of radical measures needed to make a real dent in Scotland’s inequality. Instead, both support measures like the council tax freeze, which works to the benefit of the better off. The assumption, that Scots want a more egalitarian society, could be easily tested. Supporters of such a society could contest elections. Yesterday, there was a by election in West Fife with no left wing candidate. Not even the Scottish Greens, who contested the by election in the neighbouring constituency at the end of 2013. Parties of the left won over 14% of the votes in the 2003 Scottish Parliament election. Last night it was down to 0% – this despite a huge crisis in capitalism in 2008. Changing our society means fighting and winning elections. The left has to confront this. Actually no. There is not a fixed amount of wealth. We should seek to grow our wealth and converge over time, so that poorer people get wealthier faster than richer people – but everyone gets wealthier. Scottish Labour Party with differing nuances of policy from the HQ based in London. The apogee of political achievement for any seriously ambitious Labour politician from north of Hadrian’s Wall is a ticket to Westminster and eventually, after a period of acquiescent polishing of the green leather benches, promotion to the House of Lords, a grand title and comfortable obscurity and profitable retirement. More than a little worried that someone is suggesting voting labour after independence – good god – can you picture Lamont as the leader of a free Scottish Nation??? We’d be a laughing stock! It will be a very different Scotland if the Yes vote succeeds and in ways that will surprise even those most dedicated indies. Confidence will grow and the whole political climate will change in exciting ways I am sure. This nation has done many great deeds and some horror deeds but we are a clever people to have survived to this day and what an opportunity to make a better a country for all who live in it.